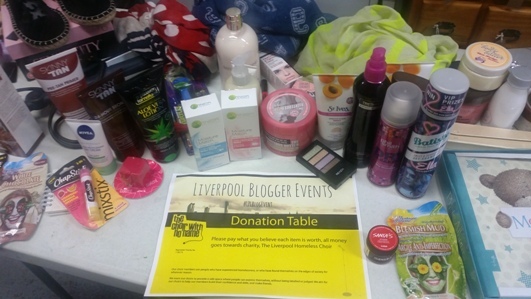 Samantha Nicole: Liverpool Blogger Event: My First Ever! I was super nervous, because I'm still really new to blogging, and I was absolutely convinced that people would be like "well, you aren't a real blogger, are you? ", but everyone was super friendly. It was nice to meet people that had blogged for many years, and everyone was quick to offer really useful advice! The event was held in Fruit + Fibres Canteen and Workshop, which is an exciting space just on the outskirts of the city centre. I don't think I would've heard of this venue if the event hadn't have been there, but I will absolutely make an effort to go in the future, considering it's so close to where I live! It's hidden in an old industrial estate, so is a little difficult to find, but is worth the effort. They do all kinds of home cooked food, and run regular family-friendly craft workshops, so it's worth checking out. With this being my first event, I had literally no idea what to expect. My boyfriend said to me as I left "Did you by any chance get any business cards?" Of course I hadn't. I said "Pfft, no. I'm not going to need a business card." If yesterday taught me anything, it is that I should have brought business cards. This event was organised by the lovely Jenny, and she had a lot of interesting and exciting stuff planned for us. First up was a presentation from Andrea at MyShowcase, which is from what I understand, a little like Body Shop at Home Parties. You can become a rep and hold all kinds of events. 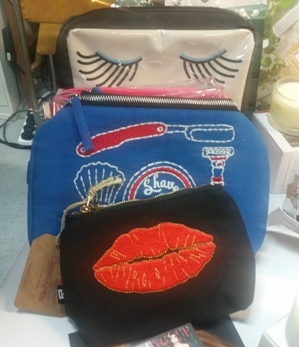 They have a number of brands on board with them, one of my favourite being the Emma Lomax embroidered bags. 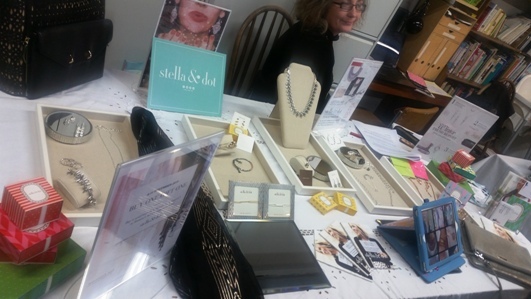 Next was Tiff from Stella & Dot. I'm generally not a huge fan of jewellery, because I have a habit of losing pretty much everything, but they had some pretty stunning pieces. 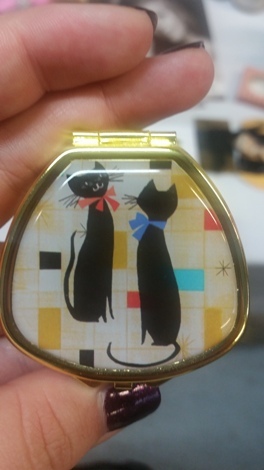 My favourite was the handbag that had a clutch bag that zipped on to the front. I ended up missing the Taking Shape and some of the Motives Cosmetics talk, because I wasn't feeling too great and had to wait outside (lame), so I grabbed Sally from Taking Shape whilst we were eating to see what I missed. I'd already been to Taking Shape before, and had bought a dress for my boyfriend's sister's wedding, so I already knew they were fabulous. I find it a little difficult to find nicely fitting plus-size clothes in Liverpool , and anything I've ever tried from Taking Shape is flattering and well made. I am definitely keen to hear more from these! Before we stopped for a break, we had a quick talk from Lush (Keep it green on the soap scene!) They introduced the charity of the day, The Choir with No Name. All of the day's sales of Lush's Charity Pot, the raffle and the donation table all went to this cause, which I think is absolutely brilliant. The food from the buffet is definitely worth a mention too. Mini bangers and mash, and Mexican tuna sandwiches; incredible! All lovingly made by Anthony at Posh-Nosh. 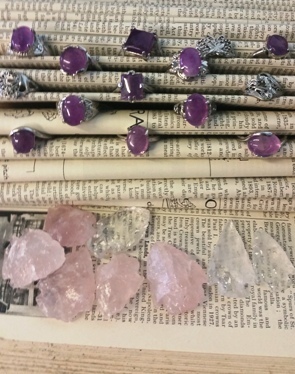 After the food, we got cracking with our jewellery making, thanks to the talented Brittany at Noctua. 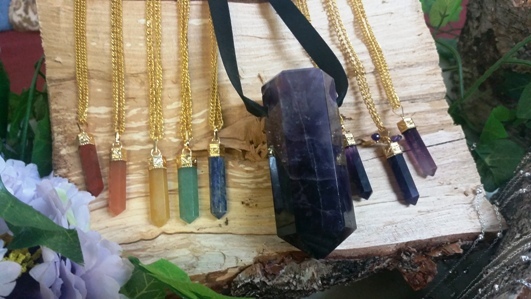 She messaged us a couple of weeks before, asking us which crystals we wanted to use, and I chose Lapis Lazuli. The bracelet making itself managed to be both therapeutic, and incredibly frustrating at the same time, but the bracelet turned out beautifully! I'm regretting not getting something else from Brittany on the day! 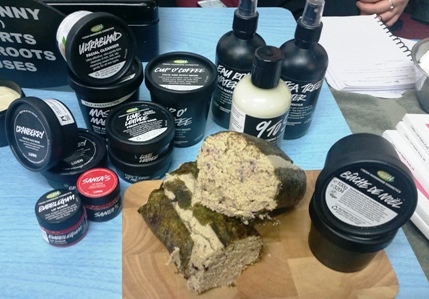 After the jewellery making, Lush started their skincare workshop. As I'm sure you're all aware, I am a HUGE Lush fan, and I had been incredibly stoked for this part since I heard they were attending. They asked for a volunteer for a skincare demo, and I practically threw myself up there. Megan, who is Lush's PR Manager, demoed Ultrabland cleanser, Don't Look At Me fresh face mask, Eau Roma water, and Charity Pot. I'd been eyeing up the Don't Look At Me mask for a while, and I'm probably going to go out and purchase this, because it smells absolutely incredible. Last but not least, the raffle was drawn and we got to check out the donation table. The donation table was a nice little touch. All the bloggers brought in things they didn't use/want any more, and other bloggers could take them, and donate what they felt the items were worth. I picked myself up a scarf, earring set, Santa's lip scrub and strawberry and banana chapstick. 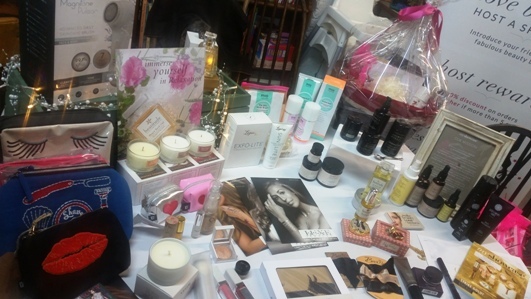 I also won twice on the raffle, picking up a Pulsaderm Buddy and some St Moriz fake tan. I met some wonderful people at the event, particularly the ladies sat at the same table: Alisha (and her hubby! ), Alcione and Stephanie. 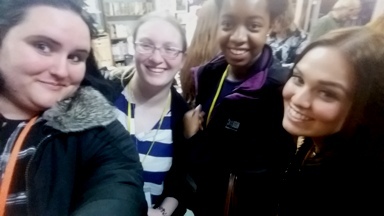 I had a brilliant time, and anyone too nervous to go to their first blog event, definitely go! I'm going to do a separate post on the contents of the goodie bag we got, because there's just so much stuff! This post is incredibly wordy, and I've tried to cover as much as possible, so I'll go into a lot more detail about the specific products in my next post. 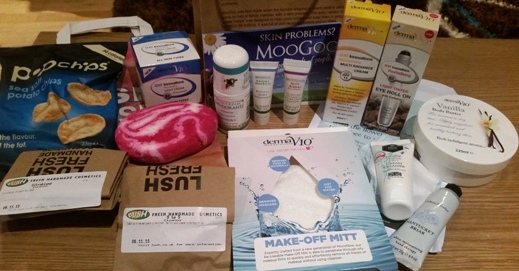 There were too many amazing products in the goodie bag to cram into this post! It was a fab event! Looking forward to the next one!